Almost everyone on earth has used a measuring tape at one point in their lifetime. Measuring tapes are common tool but choosing one can sometimes become a small challenge. With measuring tapes having many options available, it can be overwhelming. Throughout this article we are going to look at the different options available and help you determine the best measuring tape for your needs. First we will discuss the different types of housings available. The housing is what the measuring tape coils in when it is retracted. There are two different types of housings, open and closed. An open housing is ideal for outdoor use. It is easy to clean any debris that might get caught in the tape and most open tapes can be cleaned with soap and water. Some open models, like the Keson long tapes (also known as Reel Tapes), feature a rubber shovel handle for extra comfort and a sturdy grip. Closed housing measuring tapes are ideal for indoor use. It is compact and you do not have to worry about debris. A closed housing keeps the tape protected when not in use. Most feature a belt clip and a lock so you do not have to worry about the blade retracting during use. Some even feature rubber grips for extra comfort. If you need heavy duty housing, a metal housing is much sturdier than plastic. The next thing to consider is the “blade”. This is the actual tape the measurements are marked on. The two most popular types of tape material are Steel or Fiberglass. Both of these options have pros and cons. Most pocket measuring tapes have metal blades. They are more durable and have a longer life expectancy then fiberglass. Metal tapes will not stretch but are affected by extreme heat. 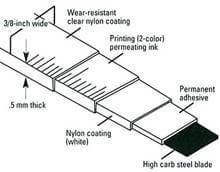 Most have nylon or lacquer coating to protect the tape from rust and wear. The higher the number of coats, the longer the tape will last. 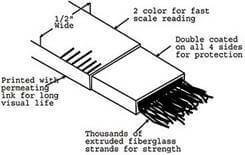 Fiberglass measuring tapes are less expensive and will not rust. They will stretch if excessive pulling force is applied. Tapes with a high number of fiberglass strands are stronger and will return to its original size after the force is relieved. -If you are working around electric hazards, it would probably be best to choose a fiberglass blade because metal blades will conduct electricity. -If you are working in a windy area. The longer the blade is extended, the more it could be affected by wind. Also, thinner blades are lighter and less affected by wind. -“Stand out”, is how far a tape can be extended before it "breaks" or bends down on its own. -Imperial (English) = feet and inches, usually to the 1/8th or 1/16th. Official unit of measure in the USA. -Engineers’ (Tenths) = feet, 10ths and 100ths. Most commonly used by Engineers, in this unit of measure the foot is divided into 10’ths and 100ths. If you need more than one unit of measure don’t worry about converting it. Some tapes feature two different units of measure, one on each side. 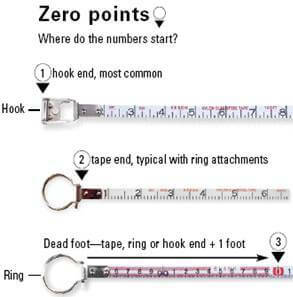 Measuring tapes have different “end” options for different methods of use. The Hook can attach to corners and edges of boards. Most hooks feature a small notch so it can hook onto a nail. On some tapes the hook will slide to adjust for the width of the hook. A ring end is another great option. It can be placed onto poles, stakes and nails. It is also less likely to get caught in debris. Some measuring tapes do not have zero start at the end of the blade. Sometimes it will start a foot back. This is called an offset zero or a “dead foot” (because the first foot of the blade is unmarked). This is useful if you are not able to place the end of the tape directly at the start point. You can set up a stake a foot past the start point and line zero up with where you want to start measuring. Long tapes have a crank handle to retract the blade once it has been extended. Some Keson long tapes feature a 3 to 1 speed rewind. This means for every rotation of the handle the tape is rotated three times. This is not only easier but faster as well, saving you time and effort. When using a speed rewind do not rotate the handle as quickly as you would with a normal rewind. The gears are moving much faster than the handle. Rewinding at a high speed can cause the gears to wear. Wind the tape slowly. Also, do not use the handle to put tension on the tape this will also cause the gears to wear. For added comfort, some reel tapes feature a padded crank handle. This compact closed housing measuring tape fits in a pocket or on a belt. The large lettering is perfect for photographs that require scale. Ideal for law enforcement and insurance adjusters. These measuring tapes are made of a hard material, such as wood or fiberglass, which fold closed in a zigzag pattern. It does not have housing. It lies flat on work surfaces and will hold up well under extreme weather. Ideal for engineers, plumbers, masons and mechanics. Designed to measure seismographs a weight can be attached to the end of the gauge and lowered to the point you need to measure. Design for easy depth identification this gauge features markings on both sides and a handle at the end for pulling taut. "Makes an ideal drag chain for rough surveying measurements. Numbers are graduated from the strap handle upward to the end of the rope." Also features a handle for pulling rope taut.